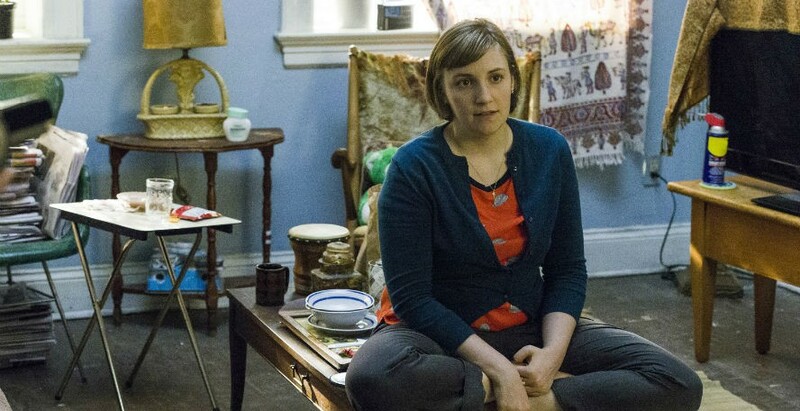 Season 4 of Girls came to a poignant and resoundingly triumphant conclusion on Monday night with episode 10, ‘Home Birth’, a winning season finale that saw Hannah, Marnie, Jessa and Shoshanna each reach an epiphany about their respective futures. 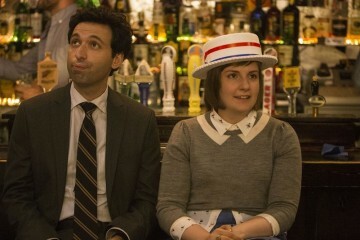 Teaming this character development with Girls’ usual balance of witty dialogue and relatable, real-world dilemmas ensured this was one of the best ever season finales of Girls. For his part, Scott can’t bare the idea of Shoshanna leaving and, in an attempt to get her to stay, offers her a job at his company. 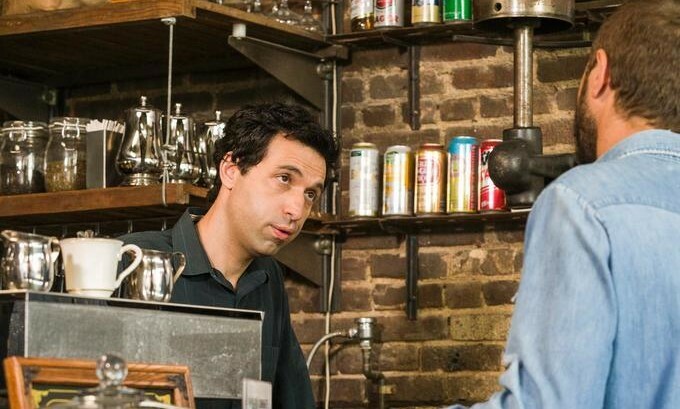 Torn, Shoshanna finds her answer following a pep talk from the most unlikely candidate: Ray’s café co-worker Hermie. Hermie quotes feminist writer Sheryl Sandberg, citing her ‘Lean In’ mantra and explaining to Shoshanna that Japan is her lean in moment. She shouldn’t turn down this amazing opportunity. If Scott is the man she thinks he is, he’ll be at the airport waiting for her when she returns. Meanwhile Marnie has her own ‘lean in’ moment, with the situation sparking from the fact her fiancée Desi feels he isn’t getting the adoration he expects from Ray. “Are we solid? Are we simpatico?” Desi inquires earnestly to Ray, who proceeds to voice aloud what the viewer and the other Girls characters have felt about Desi from the start. He tears apart Desi’s pretentious musical career and highlights the fundamental problems of Desi’s relationship with Marnie: “You string her along for months and now you propose to her in some desperate bid to make it seem as if you’re not the most selfish person in the western f***king hemisphere.” Desi doesn’t fight back, nor does he brush off the comments by accusing Ray of being in love with his fiancée. Instead he looks completely taken aback, slightly horrified. Clearly Ray has hit a nerve. Later on, Marnie is distraught when Desi is a no-show at a gig organised by their record producer Marcos (played by iconic director Spike Jonze). Marcos’ frequent, bizarre statements that Desi’s absence could be explained by his unexpected death don’t help matters. Eventually, Marnie is forced to accept Desi isn’t coming and she’s preparing to go home when Ray arrives. Ray is adamant Marnie can’t forgo this chance; he reminds her that she started as a solo artist and that she has more than enough talent to hold her own. It was great to see Marnie take control and give her first non-cringe-inducing singing performance. It seems unlikely that we’ve seen the last of Desi, but it was satisfying to see him forced to reflect on his unscrupulous behaviour. The episode’s title, ‘Home Birth’, refers to Adam’s sister Caroline’s decision to give birth to her child at home without the presence of a midwife. Caroline’s partner Laird, Hannah’s eccentric neighbour, is slightly bewildered by the whole prospect but wants to respect Caroline’s decision. Hannah and Adam find themselves reunited in their mutual attempts to dissuade Caroline, but in the end it is Jessa who takes the necessary actions. Jessa’s candid, decisive and calm manner means she gets through to Caroline in a way the others cannot. In the end the four of them carry Caroline to the nearest hospital where she gives birth to a beautiful baby girl, who is eccentrically named after Jessa and Hannah: Jessa-Hannah Bluebell Palm. The experience leads Jessa to a career-epiphany, as she returns to the apartment she shares with Shoshanna and announces: “I’m going to be a therapist!” “I’m moving to Japan!” replies Shoshanna gleefully. Whilst their mutual decisions may not pan out in the way they plan, there is nevertheless an undisputable feeling of triumph surrounding their respective career epiphanies. Arguably Hannah’s lean in moment is the hardest. Brought together by Caroline’s birth, Hannah and Adam end up alone in the hospital together, marvelling at newborn Jessa-Hannah. The sweet moment leads Adam to apologise to Hannah for the events of the last few months. He explains that he feels like he lost his way, he never really knew Mimi-Rose and he misses Hannah like crazy. Adam wants to know if Hannah would be willing to give the relationship another chance. 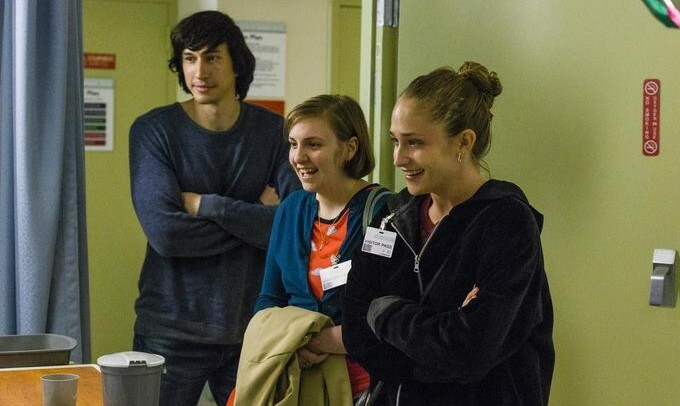 Adam Driver and Lena Dunham are note-perfect in this scene; it’s truly moving and real. As Adam leans his arm over to Hannah’s, his hand hangs expectantly, waiting for Hannah to take hold of it. 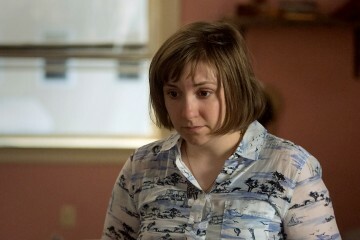 Choking back tears, Hannah responds with the simple words: “I can’t.” There is no grand speech about her independence or the way he hurt her, Hannah merely acknowledges that taking Adam back is just something she cannot do. 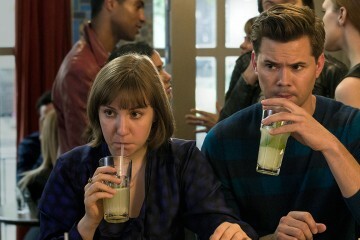 The writers and actors deserve much praise for this scene: it is simultaneously bittersweet, heart-breaking and triumphant, you find yourself rooting for both Hannah and Adam, but ultimately Hannah’s decision feels right. The episode ends with a surprising epilogue. We flash forward six months later and its winter, marking the first time Girls has depicted the cold months. Hannah is walking down the street, wrapped up in coat and hat, with none other than Fran for company. The two sweetly embrace and as the chords of ‘Carry Me’ by Family of the Year strike up, the season ends. This fourth season has been a fantastic run for Girls, and with season 5 promised in 2016 it will be exciting to see how the storylines pan out. Will Shoshanna move to Japan? Will Marnie’s solo performance mark the beginning of a career and life without Desi? Will Jessa succeed in her aim to be a therapist? Has Hannah found lasting happiness in her teaching career and in her relationship with sturdy, reliable Fran? I can’t wait to find out.